For almost a generation, New Republic naval and ground commanders have looked for a solution to the problem of lower atmospheric defence. Ground commanders, faced with an ageing fleet of lightly armed T-47 air speeders, depended heavily on star fighters as their only means of high level explosive delivery. Naval commanders resisted the idea of their limited number of star fighters deployed out of their true element and being forced into a more defensive role. Thus, the need of a rapid response vehicle that was heavily armed, highly manoeuvrable, and able to deliver a significant explosive payload was recognized and the V-wing speeder was born. The V-wing is a highly versatile craft that can be used in a number of roles for planetary defence. 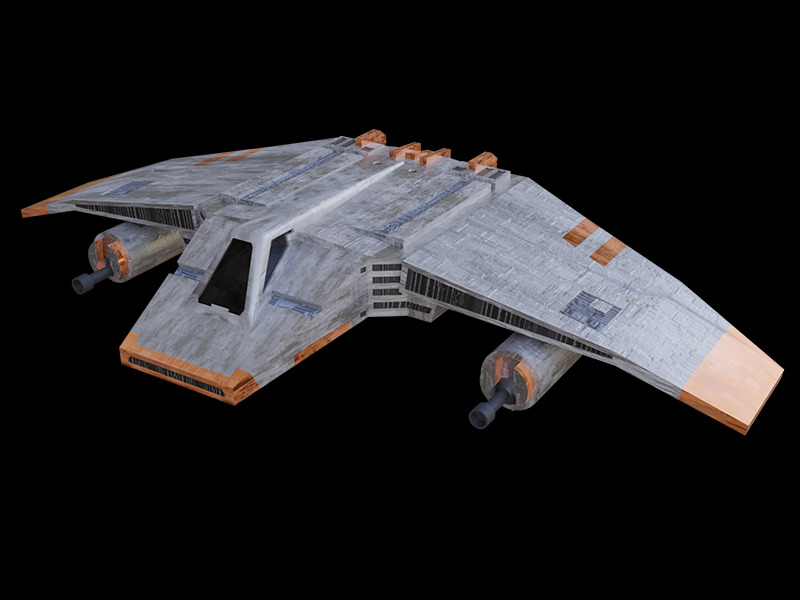 The craft was built off of a discarded star fighter design for a light in-system craft. The original design was scrapped due to several specific "soft points" on the hull which caused atmospheric leakage and made it impractical for interstellar use. The primary role of this air speeder is lower atmospheric defence against troop transport and light fighters, but the V-wing has also shown potential in bombing runs, and as a close infantry support vehicle. Armed with two medium range blasters and a proton-torpedo launcher, this craft can be the hinge on which battles turn. The innovative thruster-based steering gives the V-wing a slight advantage in manoeuvrability over its earlier competition, the T-47. It is also equipped with a "rapid-fire" module that allows the blasters to be fired in rapid succession for three seconds; a useful feature for quickly taking down the target vehicle's shields and allowing for a follow up attack with a proton torpedo to completely neutralize the target. While the V-wing's top speed was normally 1000km/h, a scramjet booster boosts the airspeeder's speed by an additional 400km/h. However, prolonged combat at such high speeds was dangerous since overuse of the booster may overheat the drive system. One of the major disadvantages of the V-wing is its armour. The afore mentioned "soft points" make the V-wing's armour sub-par, and consequently causes much concern for pilots that find themselves on the wrong end of the enemy's blasters. The standard sensor package is also very limited. This factor causes pilots to rely heavily on ground based radar systems, and air controllers for instructions during a battle. These flaws notwithstanding, the V-wing has proven itself worthy to fight on the battlefield of today and tomorrow.